A microtiter plate was coated overnight with Human Anti-Natalizumab Antibody (clone AbD21375, HCA248) at a concentration of 1 μg/ml. After washing and blocking with PBST + 5% BSA, 10% human serum was added spiked with increasing concentrations of natalizumab (therapeutic reference product) or Human Anti-Integrin Alpha 4 Antibody, MCA6104 (natalizumab biosimilar, research grade). 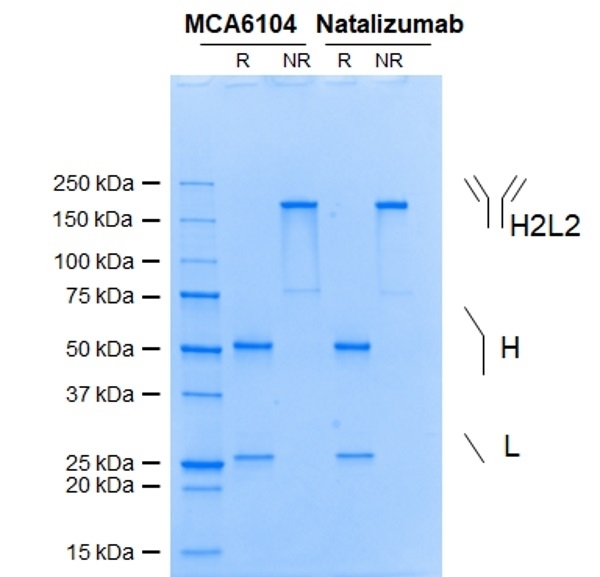 Detection was performed using HRP conjugated Human Anti-Natalizumab Antibody (clone AbD21375_hIgG1, HCA249P) at a concentration of 2 μg/ml in HISPEC Assay Diluent (BUF049A) and QuantaBlu Fluorogenic Peroxidase Substrate. Data are shown as the mean of three measurements. 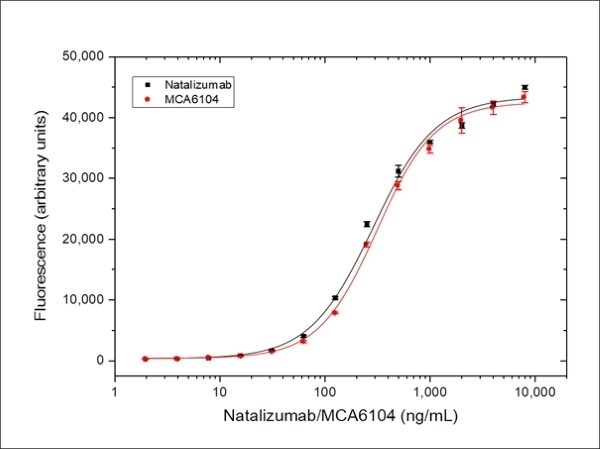 0.5 μg of Human Anti-Integrin Alpha 4 Antibody, MCA6104 (natalizumab biosimilar, research grade) and natalizumab (therapeutic reference product) were denatured and analyzed under reducing (R) and non-reducing (NR) conditions. Bands were visualized using Coomassie staining. Full IgG (H2L2), heavy (H) and light chains (L) are indicated. Size exclusion chromatography (SEC) of Human Anti-Integrin Alpha 4 Antibody, MCA6104 (natalizumab biosimilar, research grade) and natalizumab (therapeutic reference product) was performed on an analytical HPLC instrument. Shown are monomer peaks (H2L2), calculated relative monomer portion and aggregates. Column: MAbPac SEC-1, 5 μm; dimension: 4.0 x 150 mm; mobile phase: 50 mM sodium phosphate, pH 6.8, 300 mM NaCl, 200 mM Arginine; flow rate: 200 μl/min; inj. volume [μl]: 3; temp. : 25 °C; detection: 280 nm; sample: mAb (1 mg/ml). Anti-Integrin Alpha 4 Antibody is a non-therapeutic biosimilar of the monoclonal antibody drug natalizumab (Tysabri) for research use. It can be used in bioanalytical assays and for studying biological pathways affected by the drug. Human Anti-Integrin Alpha 4 Antibody is a research grade biosimilar of the monoclonal antibody drug natalizumab. It is a recombinant human IgG4 kappa antibody with variable regions from the therapeutic antibody natalizumab. Human Anti-Integrin Alpha 4 Antibody is for research use only. It is suitable as a reference standard in a pharmacokinetic (PK) bridging ELISA with anti-natalizumab antibodies, for example HCA248 and HCA249P. It can also be used as capture and detection reagent in an anti-drug antibody (ADA) bridging ELISA, with an anti-natalizumab antibody in IgG1 format as reference standard, for example HCA249. Natalizumab (Tysabri) is a humanized IgG4/kappa monoclonal antibody approved as a monotherapy for the treatment of relapsing forms of multiple sclerosis and for the treatment of Crohn’s disease. Natalizumab is also being evaluated for potential clinical use in the treatment of B-cell malignancies. This therapeutic antibody, directed against alpha-4 integrin (CD49d), binds to alpha-4/beta-1 integrin on the surface of circulating leucocytes. It is believed to act by blocking the interaction of alpha-4/beta-1 integrin with vascular cell adhesion molecule-1 (VCAM-1), preventing the adherence and transport of inflammatory immune cells across the intestinal lining and blood-brain barrier.